It’s winter in the Texas Panhandle, and the ranch is covered in snow and ice. 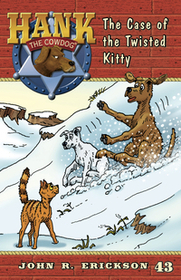 Hank decides to follow Pete the Barncat’s advice and bravely escorts Sally May’s car down the slick road. Before Hank realizes what’s happening, Sally May’s car skids into a snowdrift--and she is angrier than ever! And who does she blame but Hank! Is this just another stroke of bad luck for poor old Hank--or is it a malicious plot laid by his arch nemesis, Pete?